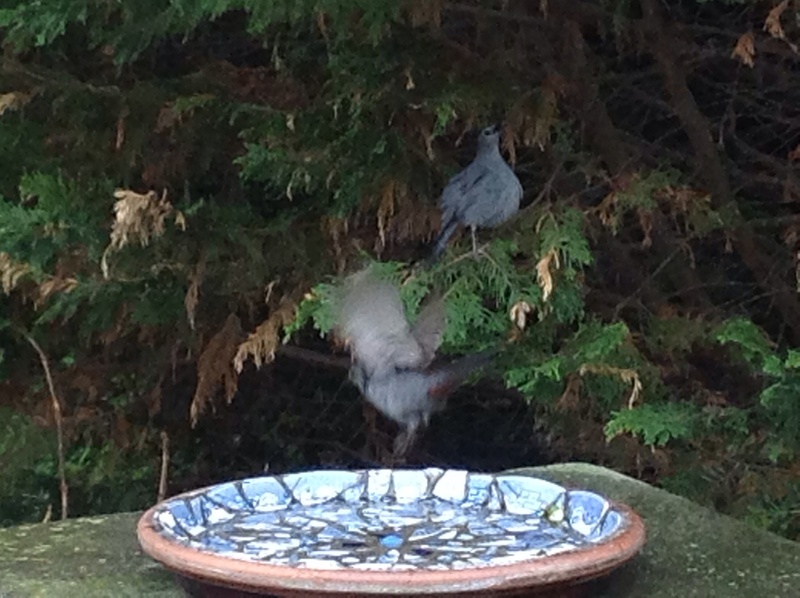 In my garden I have several birdbaths to attract feathery friends. One is a concrete classic pedestal birdbath. Another is a low-to-the ground copper birdbath I was told robbins would enjoy. Yet another is a glass vessel intended for small birds. 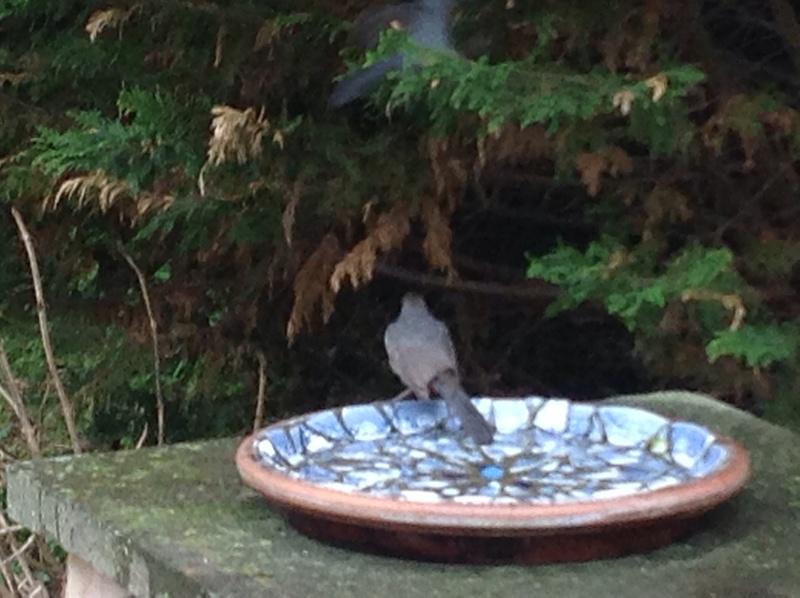 None, however, attracts birds quite like the mosaïc birdbath I made myself from broken shards of china set onto a terra cotta saucer. 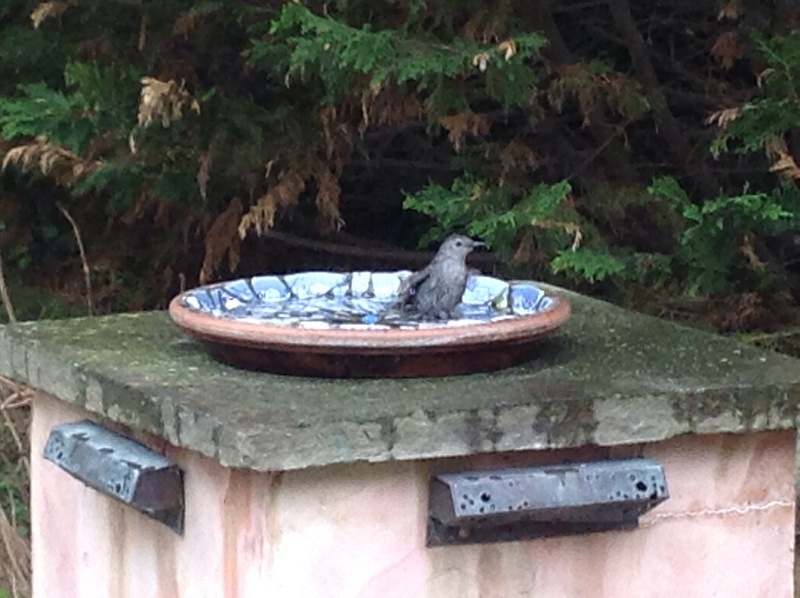 This birdbath is several years old. The grout has not eroded from being immersed continuously in water. The birdbath is emptied and stored in a garden shed for the winter months to prevent the terra cotta and grout from cracking in freezing temperatures. Note how I placed the smooth outer edge of the broken plates along the top of the birdbath to avoid sharp edges. Even filled to the brim with water, the mosaïc pattern is still fully visible. It is by far, the most popular of the birdbaths, with often different species of birds perched in nearby trees waiting for a turn! I think the shallow depth is an attraction and perhaps the textured surface provides traction and support to the birds’ feet. Maybe it’s the colorful tile that attracts the birds. Whatever the reason, this is where we get great peep shows all gardening season! Bath interrupted! Do you see the other bird waiting in the tree for a turn? For more inspiration, search google images for “mosaic birdbath project” and you will be rewarded with dozens of equally beautiful and different images of mosaic birdbaths. 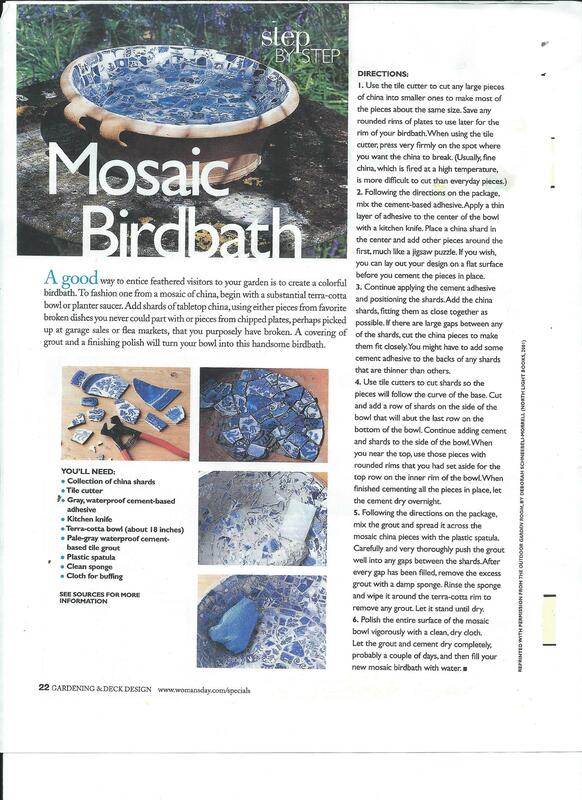 The instructions could also be applied to an existing concrete birdbath you’d like to line with mosaïc tiles/china. Wishing you many happy bird watching moments in your garden! 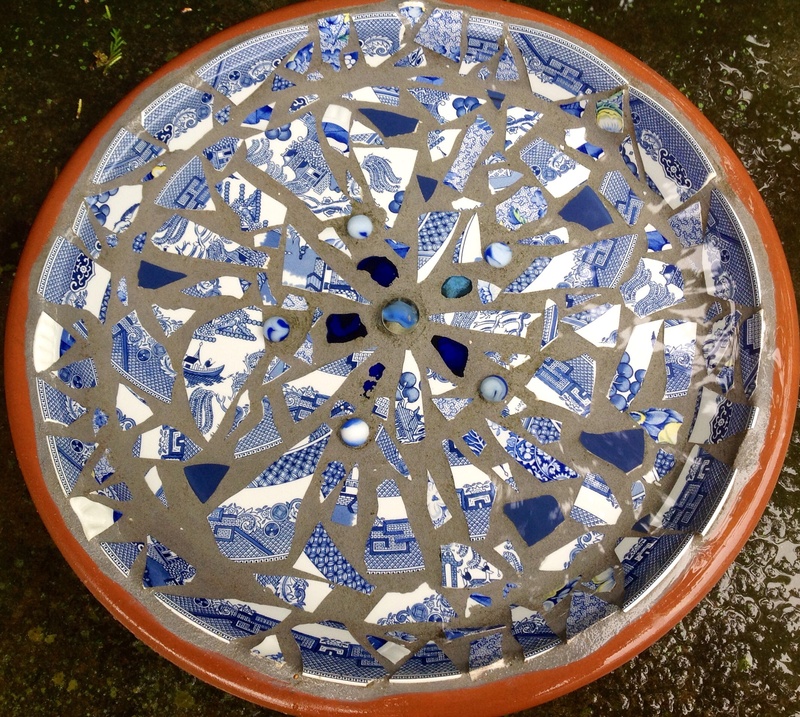 This entry was posted in Crafts, Gardening and tagged convert your broken ceramics into a backyard birdbath, Mosaïc birdbath DIY project, Mosaïc craft project, Using a terra cotta saucer to create a birdbath by Johanne Lamarche. Bookmark the permalink. This is a terrific way to make lemonade out of lemons! If you break some china, it’s OK. A birdbath is afoot!!! What a great idea!! !